In the spirit of community, Cane Bay Partners VI, LLLP, has launched Cane Bay Cares, a $1 million fundraising campaign in partnership with the Community Foundation of the Virgin Islands to help bring much needed relief and jumpstart rebuilding efforts on the island of St. Croix, which was ravaged by two hurricanes in September. St. Croix is the home base of Cane Bay Partners VI, LLLP. Johnson, along with Cane Bay Partners VI co-founder Kirk Chewning, came up with the Cane Bay Cares initiative as a way to help. “We are deeply saddened by the destruction of our community and want to help those in need as quickly as possible and start the rebuilding process,” Chewning said. The Community Foundation of the Virgin Islands, or CFVI, is a longstanding and respected 501(c)(3) in the Virgin Islands and 100% of the funds donated through the Cane Bay Cares fund are tax deductible and go to aid St. Croix. Johnson and Chewning are pledging to match, dollar for dollar, the first $200,000 that is raised. The initiative has also drawn an initial $50,000 anonymous donation. “We are well on our way,” Johnson said. While Cane Bay Cares was launched this week, Cane Bay Partners VI has been supporting the St. Croix community and its employees all along. In an effort to ensure employee safety and business continuity, Cane Bay Partners chartered a 737 with Miami Air International and offered all of its St. Croix employees the opportunity to evacuate with their families and even their pets just ahead of the arrival of Hurricane Maria. The staff and their families were also better able to assist with relief efforts by being stateside where cell coverage, Internet access and other resources are widely available. After the storm passed, the company chartered another 737 plane through Miami Air and offered those employees and their families, who had opted to stay behind, a chance to evacuate so they could be safe and continue working while the significant storm damage to Cane Bay Partners’ St. Croix office is being repaired. The company expects to move employees and their families, who are temporarily working out of Atlanta, back to St. Croix once the airport opens and the office is restored. They expect to return within approximately 30 days. Cane Bay Partners also partnered with the Government of the Virgin Islands to fill the empty seats on the second flight. Among those the VI Department of Tourism arranged to get on the flight were sick, elderly, injured, pregnant women, wheelchair bound, cancer patients, dialysis patients and others in significant need. Cane Bay Partners handled all airport transfers and accommodations for its employees and their families. The company also coordinated with the Johnson Ferry Baptist Church, Carroll County Chamber of Commerce and the University of West Georgia to provide transportation, immediate needs and housing to anyone in need upon arrival in Atlanta. In total, with both flights, Cane Bay Partners got approximately 230 people off the island who needed to leave for different reasons. On Sept. 6, Hurricane Irma reached the U.S. Virgin Islands as a strong Category 5 hurricane, causing massive damage on St. Thomas and St. John. St. Croix, 40 miles to the south, experienced damage, but was spared Irma’s full force. Cane Bay Partners founders and employees were among those responding to the sister islands with aid and support. A week later, the islands were spared a direct hit from a strong Category 4 Hurricane named Jose, but the region suffered significant flooding from the out flows of the storm. Less than one week after that, Hurricane Maria was also a strong Category 5 storm when its eye passed just south of St. Croix, leaving massive damage to the island in its wake. Cane Bay Partners is now asking people, businesses and partners to support Cane Bay Cares with a cash donation. All contributions are tax deductible and 100% of donated funds will be dedicated to providing relief and rebuilding efforts to the island of St. Croix. Cane Bay Cares is a service initiative of St. Croix-based Cane Bay Partners VI, LLLP. 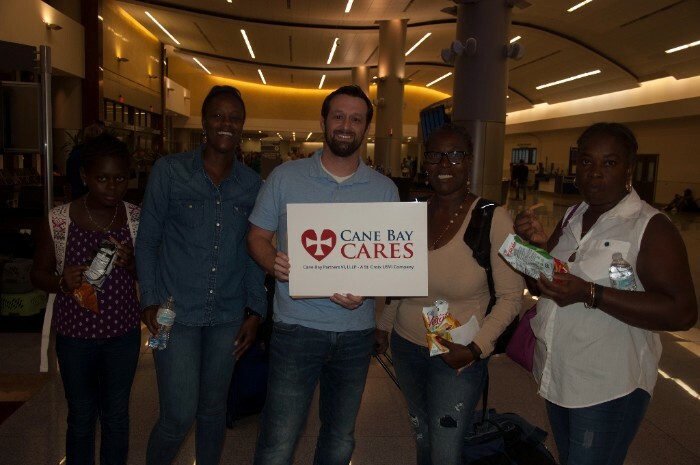 Cane Bay Cares was established after two Category 5 hurricanes, Irma and Maria, caused much damage to St. Croix during September 2017. The initiative has a goal of providing relief to Cane Bay Partners VI employees and the citizens of St. Croix. To make this possible, we have partnered with Community Foundation of the Virgin Islands, which is a 501c3 nonprofit that was established in 1990. All donations to Cane Bay Cares are donations to CFVI and are 100 percent tax deductible. CFVI was created to serve both donors and nonprofit organizations of the Virgin Islands that want to ensure the highest quality of life for present and future generations. Its primary goal is to build a collection of permanent funds, which will be used to enhance the educational, physical, social, cultural and environmental well-being of the children, youth, and families of the Virgin Islands. 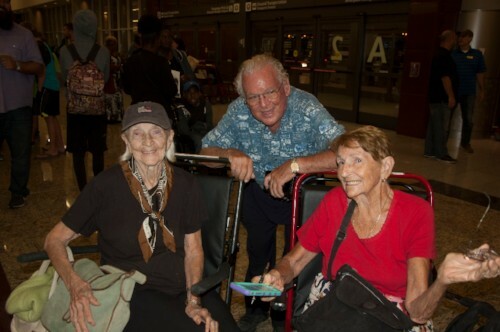 Volunteers from Cane Bay Partners VI and the Johnson Ferry Baptist Church greet evacuees from St. Croix Monday night. More than 180 people on St. Croix, along with their pets arrived in Atlanta from St. Croix on a 737 plane chartered by Cane Bay Partners VI ahead of the official resumption of commercial air traffic to the island.